The following is a summary of the recently released SKBN CU September 2017, which provides the latest statistics on food, health, education and violence in the Two Areas of Sudan: South Kordofan (Nuba Mountains) and Blue Nile state. The full report can be found below. The humanitarian situation in Sudan’s Blue Nile state continues to deteriorate. A combination of ongoing violence, flooding, and poor access to food forced 27,000 people to flee their homes in September. The crisis is also forcing people to take more desperate measures, increasing their risk of danger. 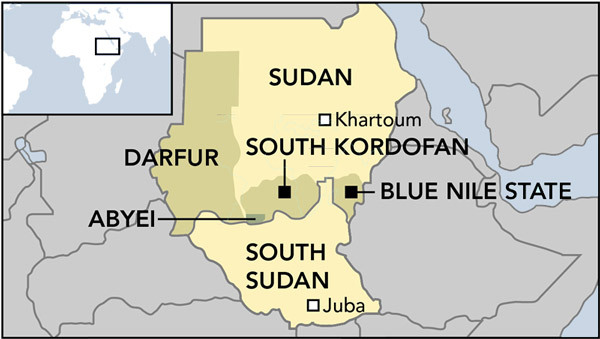 Violence between the SPLM-N and the Sudanese Armed Forces continued into September. Reports of attacks on civilians markets, crops and livestock is only exacerbating the sheer lack of food. 27,000 people fled the violence in September, with many facing ethnic and communal violence as they cross into camps in South Sudan. Severe food insecurity in Blue Nile state stands at 39%, with 11% of the population suffering the highest level of food insecurity. Ongoing conflict and flooding have ruined the region’s agriculture, and the increasing number of IDPs is only exacerbating the humanitarian situation. Due to the scarcity of food, people are being forced to cultivate land ever closer to the front lines, which is extremely dangerous. There have been reports of cases of Acute Watery Diarrhoea (AWD), raising fears of an outbreak in the region spreading from other areas of Sudan. This only adds to other health issues affecting the region, such as malaria and water-borne diseases, all of which are likely to be exacerbated by the recent flooding and continued lack of access for humanitarian assistance.